“For me, getting out of that hospital bed and dealing with the emotional side of my recovery was a key step to getting to where I am now,” Lee said. The Cohen Veterans Network (“CVN”) pilot clinics in San Antonio and Dallas helped more than 1,100 veterans and military family members in their first years of operation. The network will leverage that success with two more Cohen Clinics in Texas, opening in El Paso and Killeen in the coming months. The Steven A. Cohen Military Family Clinics in Texas were each joined by a U.S. Army veteran and U.S. Paralympic athlete, to help mark the first anniversary. 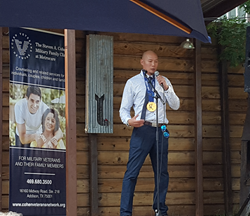 Sitting Volleyball gold medalist (2016) Kari Miller spoke to group of community leaders at San Antonio’s anniversary event in May. Jen Lee, a 2014 gold medalist in Sled Hockey, addressed a similar crowd this month in Dallas. CVN’s partner in San Antonio, Family Endeavors, will also operate the Cohen Clinics in El Paso and Killeen. The State of Texas has provided partial funding to help establish each location, thanks in part to the efforts of State Senator Jane Nelson (District 12). “As the daughter of a World War II veteran, I am grateful for the work of those supporting our veterans and their loved ones – especially families impacted by post-traumatic stress and other mental health challenges,” said Senator Nelson. The Cohen Clinic in El Paso will open by the end of summer, while Killeen will open by the end of fall. CVN’s partner in Dallas, Metrocare, was the first in the network to launch CVN Telehealth. The CVN Telehealth platform is a secure, HIPAA compliant, online video session between a clinician and a client. This allows for clients to take part in a therapy session from the comfort of their home using devices such as a tablet, smart phone or desktop computer. The network formally launched in April 2016 behind a $275M commitment from Steve Cohen, Chairman and CEO of Point72 Asset Management. Learn more about Cohen’s commitment to veterans. The Cohen Veterans Network is a 501(c)(3) nonprofit foundation whose mission is to improve the quality of life for post-9/11 veterans and their families by focusing on improving mental health outcomes. The goal of the Cohen Veterans Network is to build a network of outpatient mental health clinics for veterans and their families in high-need communities, in which trained clinicians deliver holistic evidence-based care to treat mental health conditions.